There are games that are tense enough that by the time you finish them you are as sweaty and exhausted as Rocky Balboa at the end of his famous run through Philadelphia (though it’s unlikely you’ll have been cheered on by as many children). In some gaming groups, the victor may be as bruised and bloody, and the losers as reviled as a pummeled Dolph Lundgren. Top Promoter is not one of those games. And that’s fine. I mean, who wants to end a game that beat up, no matter what side of the victory line you fall on? Rather than Rocky Balboa, Top Promoter puts you in the role of his manager, assigning a roster of fighters in a range of weight classes to a series of bouts in cities across the world. As a promoter, sometimes you have to put up a lesser fighter against a more bruising opponent so you can save your best boxer for a higher profile match in a city that will pull in the cash. It’s a bit mercenary, but everyone knows the business of boxing is every bit as brutal as what goes down in the ring. Players begin by selecting a deck of fighters and actions. There are five decks in the game, each containing an identical distribution of cards, differentiated only by color. A number of Location cards, equal to the number of players minus one, are laid out in the main play area. Players shuffle their decks, draw six cards, and play begin. Decks consist of two kinds of cards – fighters and actions. Each fighter has a weight class, a Popularity score, a dice stat, and a hometown. 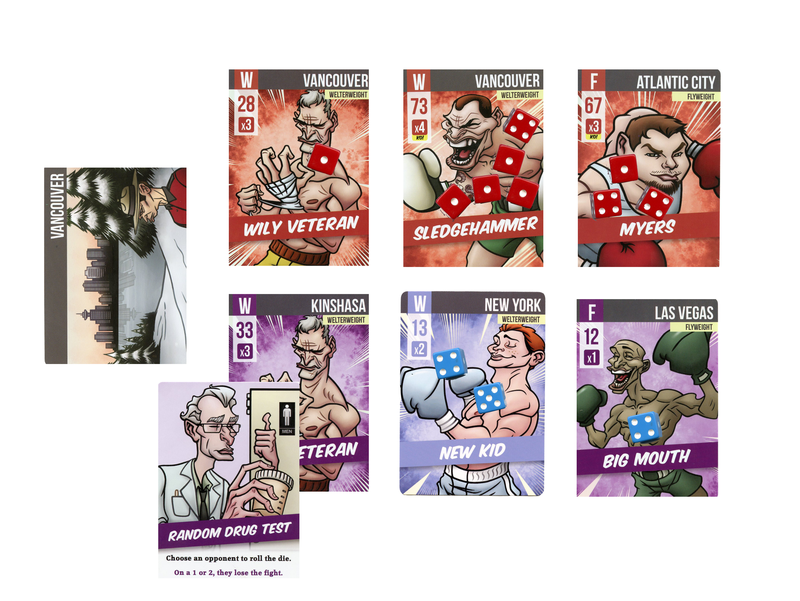 In addition, some fighters have a Knockout score – a special dice combination that can be rolled for an instant win and a premium cash award during the bout. The small number of action cards can be played either as fighters are being assigned to bouts, or after bouts have begun, depending on the card. At the beginning of a round, each player selects a fighter from their hand and places it face down in front of them. 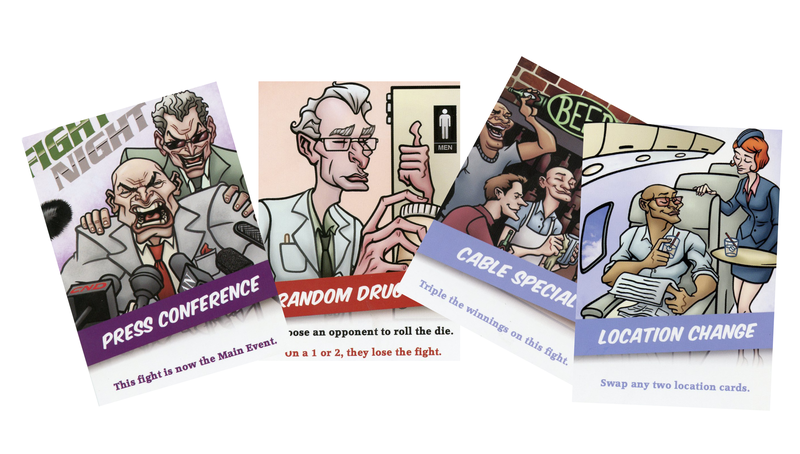 Once all players have selected a card, the fighters are revealed. Play order is then determined by the Popularity scores of the revealed fighters – highest Popularity going first, and then advancing in descending order. Players will then assign their fighters to a a bout at a location, keeping in mind that fighters receive a one-die bonus for fighting in their hometowns. Placement of boxers are limited by a few conditions: players cannot pair their own boxers against each other, they have to assign their boxers to bouts of the same weight class, and they can’t assign their boxer to a new bout if a location already has a boxer of the same weight class open. A location can hold three bouts, and each bout consists of two fighters. Once a player assigns a fighter to a city, she can play one of a small number of action cards that do things like swap location cards or move the bout her fighter was assigned to higher in ranking. In some cases, it’s possible that a player may not have a location to assign their fighter because there is no open bout in their selected fighter’s weight class, probably because another player filled a bout ahead of them. In this case, their fighter is simply discarded and play continues. If at any point an assigned fighter causes a location to have three full bouts, the fight immediately commences at that location. Resolution of bouts begins with the bottom-most pair and proceeds upwards to the Main Event. Players receive more rewards the higher up in position their match is $1 million, $2 million and $3 million respectively. Combat is very simple. Players roll a number of six-sided dice equal to the Dice Stat of their fighter, with a couple of modifications. They may play a Superior Training card with will add a die to their roll. As mentioned earlier, fighters competing in their home towns also receive a bonus die. After each pool of die is rolled, victory is determined in one of two ways: 1) Players arrange their dice in descending order and compare rolls, one player comparing their highest roll to their opponent’s highest roll, until one player beats their opponents’ score. or 2) A fighter with a knockout stat rolls the particular combination of dice needed to complete their knockout. To illustrate: player one has a dice stat of 3x, while player two has a dice stat of 2x. Player one rolls 3 dice, while player two rolls 2. They then compare rolls. Player one rolled a 4, a 2 and a 2, while player two rolled a 6 and a 1. In this case, player two wins the bout with their roll of 6. In another case, two fighters each have a dice stat of 4x. Player one rolls a 6, 5, 5, and a 3, while player two rolls a 6, 5, 4 and 4. Comparing scores, the players see their their highest roll, 6, ties. Their second highest rolls, 5, also tie. The third highest rolls – the third round of the bout – sees player one with a 5 compared to player two’s 4. Player one wins the bout. Only a handful of fighters have knockout capabilities, and the combinations that result in knockout are pretty straightforward: three of a kind in one case, a consecutive run in another, and a Full House on the third. If a fighter rolls their knockout score – regardless of the value of their dice – they win the bout. An example of a night of fighting is contained below. In the first fight, Myers wins in two rounds, since in the first round he and Big Mouth both had fours, but in the second round Big Mouth had no die and lost. In the second match, Sledgehammer rolls an extra die, which would seem to spoil his KO chances and cause him to lose the match; but extra die only count if they contribute to a KO, so he beat New Kid in a knock out. Finally, in the main event, the purple Wily Veteran lives up to his name and plays a drug test card on his opponent, who roles a 1 and loses the bout. Awards are then assigned to the victors. A player may receive bonus awards for a number of conditions; for example, a Slugfest – a bout that goes on for several rounds – will cause the victor to receive additional dollars, while knockouts results in a premium and underdog boxers – boxers who have a smaller dice stat than their opponents, even if a Superior Training card or hometown advantage results in that boxer having a higher dice pool – also receive a bonus upon victory. 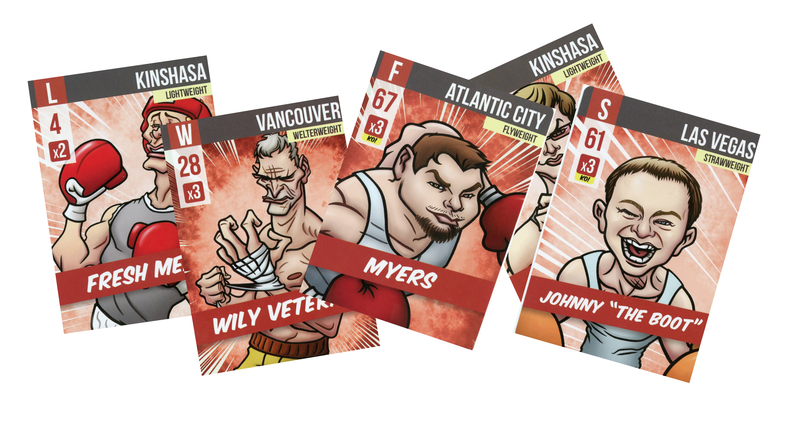 When the last bout is fought, boxers are discarded to their players’ discard piled, the location card is discarded and a new location is drawn. If this results in the last location card being drawn from the location deck, the game is over and players compare their total cash to determine the winner. If not, play continues to the next player in the round until all players have taken their turns. Hands are replenished to six cards, and play begins again. Top Promoter is a bright, exceedingly light game that manages to emulate a kind of bloodless boxing that, frankly, works just fine. This is not a game about the grueling, brutal, exhausting sport of prizefighting. The art emphasizes this with colorful cards and cartoony fighters, none of whom I can recall bearing a single bruise or laceration. It may be a boxing game, but it’s certainly family-friendly. The game plays quickly, and even though there are some decisions to be made when selecting a fighter, it is not a tough decisions and as the game moves forward that decision – due to a shrinking number of fighters and actions in a player’s hand – will become less critical, so there is little chance of the game hanging up due to analysis paralysis. There is some light strategy involved in terms of selecting one’s fighter each round and deciding where to assign that fighter, but mostly the game comes down to luck. Top Promoter reminds me, superficially, of both Smash Up, in the sense of assigning cards to a location until that location resolves, and King of Tokyo, in that victory ultimately comes down to rolling a pool of dice. I emphasize the superficial nature of that comparison, though; to the extent that it compares to either, it is certainly a much lighter game. Player interaction is decent. Obviously, players interact during the boxing matches, and there is some interaction when players assign their fighters to bouts, with minimal jockeying for position at locations. As the game proceeds, it becomes more likely that players will be fighting to assign their boxers to qualifying weight classes to avoid having to discard a card, but even when this happened I felt it was more luck of the draw than player strategy. Variability is nil, and even if expansions were planned I have a hard time imagining how they could change the game much without adding entire new rules sets. Unlike Smash Up, location cards do nothing other than give a hometown bonus for fighters – they don’t provide any special rules or bonuses – and neither do fighters. That said, not every game needs to feel different when you pull it off the shelf – it’s OK to have something consistent and straightforward. As a family game, Top Promoter is one I would recommend. The light strategy is enough to challenge most kids into the skills of planning their moves as well as some basic hand management, but victory still mostly comes down to the luck of the die, so each player – regardless of age – has a decent chance at victory. That said, the game comes in at $35 and can be purchased directly from Game Salute at their website, or via Amazon.com. While it’s a fine game, $35 is too high a price point given the components – some cards in an oversized box, dice, and cardboard tokens. If you can get your hands on this for $20 or $25, it would make a fine addition to your family game night collection. Top Promoter is quick, easy to pick up, light without being empty, and a lot fun. It’s not going to tax your brain, but as a warm up before the main match of a night of gaming it’s a fine game to have on hand. For players of a certain age, Top Promoter will immediately invoke memories of that NES classic, Mike Tyson’s Punch-Out. The homage may not be intentional, but it’s effective nonetheless. In this, Top Promoter joins the ranks of other nostalgia-invoking games such as Boss Monster and Attack at Kemble’s Cascade, though without the 8-bit artwork that makes the homage explicit. Other reviewers have expressed frustration with the combat mechanic in the game, which involves each player rolling a pool of dice and the victor being determined by whichever player rolled the highest value die. I was rarely as frustrated, in part because it’s unlikely that the boxer’s pool size will be separated by more than a die, and thematically its appropriate that every once in a while the underdog beats the big guy. Game Salute is notorious for their tuck boxes, and Top Promoter is no exception. The box is probably twice as large as it needs to be, designed as it is to hold six tuck boxes, each of which is about three times as large as it needs to be. Unless there are ambitious plans for expansion of the game, this feels like a lot of wasted space, as the whole game could probably fit in two of the tuck boxes. When I initially wrote this, I claimed that each deck was differentiated only by color, and that otherwise the art is the same for each of the five groups of cards. I later reviewed this and discovered I simply wasn’t paying attention – while the power range for cards seems to be the same for each deck, and there are some cards that are identical in each group, there are also some unique cards, with unique artwork and fighter names, in each deck as well. The fact that I didn’t really catch this on my couple of playthroughs suggests I need to increase my powers of perception, or that the game art doesn’t really draw much attention to itself. I was a bit skeptical of the theme at first – almost all the games on my shelf are fantasy, sci-fi, or horror themed – but warmed up pretty quickly. Top Promoter trades the deep mano-a-mano combat one might expect from a boxing game for more of a strategic fighter management game (it is Top Promoter and not Top Boxer after all) with a quick dice mechanic to handle eliminations. It’s a fine entry, but certainly leaves room for other games to explore a more tense, blow-by-blow exploration of the theme.